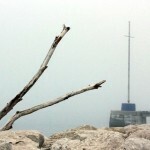 Fog is a rare phenomenon in Split, but it happens occasionaly causing confusion on the sea. 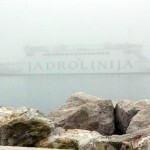 Take a look at images from Split this morning and read about fog from Wikipedia. 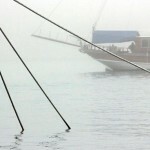 Fog is a cloud bank that is in contact with the ground. A cloud may be considered partly fog; for example, the part of a cloud that is suspended in the air above the ground is not considered fog, whereas the part of the cloud that comes in contact with higher ground is considered fog. 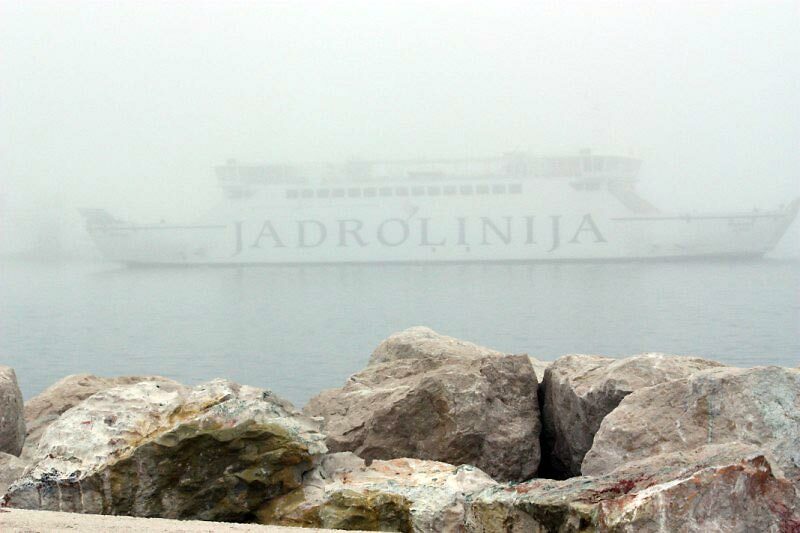 Fog is distinguished from mist only by its density, as expressed in the resulting decrease in visibility: Fog reduces visibility to less than 1 km, whereas mist reduces visibility to no less than 2 km. For aviation purposes in the UK, a visibility of less than 10km but greater than 999 m is considered to be mist if the relative humidity is 95% or greater – below 95% haze is reported. The foggiest place in the world is the Grand Banks off the island of Newfoundland, the meeting place of the cold Labrador Current from the north and the much warmer Gulf Stream from the south. The foggiest land areas in the world are Point Reyes, California, and Argentia, Newfoundland and Labrador, both with over 200 foggy days per year. 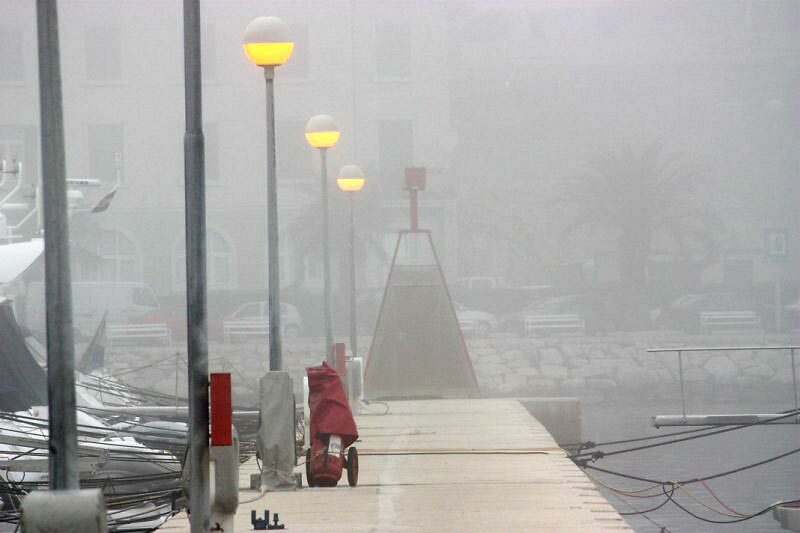 Even in generally warmer southern Europe, thick fog and localized fog is often found in lowlands and valleys, like the lower part of Po Valley and the Arno and Tiber valleys, especially in late autumn and winter. 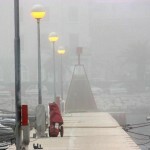 Fog forms when the difference between temperature and dew point is generally less than 2.5 °C or 4 °F. It is more common when the temperature of the air is around 5 °C or 40 °F. 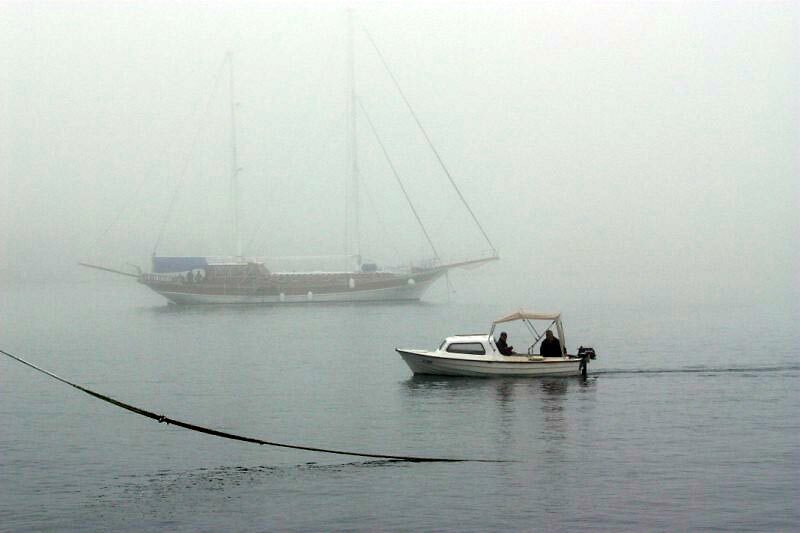 Fog begins form when water vapor (a colorless gas) condenses into tiny liquid water droplets in the air. Conversely, water vapor is formed by the evaporation of liquid water or by the sublimation of ice. Since water vapor is colorless, it is actually the small liquid water droplets that are condensed from it that make water suspended in the atmosphere visible in the form of fog or any other type of cloud. In this view, only downtown San Francisco and Sutro tower are free from fogFog normally occurs at a relative humidity near 100%. This can be achieved by either adding moisture to the air or dropping the ambient air temperature. 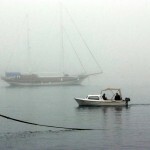 Fog can form at lower humidities, and fog can sometimes not form with relative humidity at 100%. A reading of 100% relative humidity means that the air can hold no additional moisture; the air will become supersaturated if additional moisture is added. Fog formation requires all of the elements that normal cloud formation requires, the most important being condensation nuclei, in the form of dust, aerosols, pollutants, etc., for the water to condense upon. When there are exceptional amounts of condensation nuclei present, especially hygroscopic (water seeking) particles such as salt, then the water vapor may condense below 100% relative humidity. 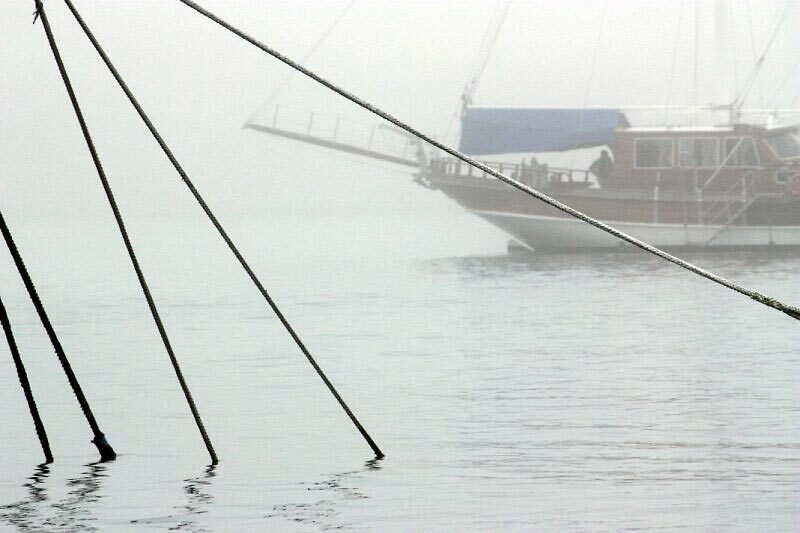 Another common type of formation is associated with sea fog (also known as haar or fret). This is due to the peculiar effect of salt. Clouds of all types require minute hygroscopic particles upon which water vapor can condense. Over the ocean surface, the most common particles are salt from salt spray produced by breaking waves. Except in areas of storminess, the most common areas of breaking waves are located near coastlines, hence the greatest densities of airborne salt particles are there. Condensation on salt particles has been observed to occur at humidities as low as 70%, thus fog can occur even in relatively dry air in suitable locations such as the California coast. 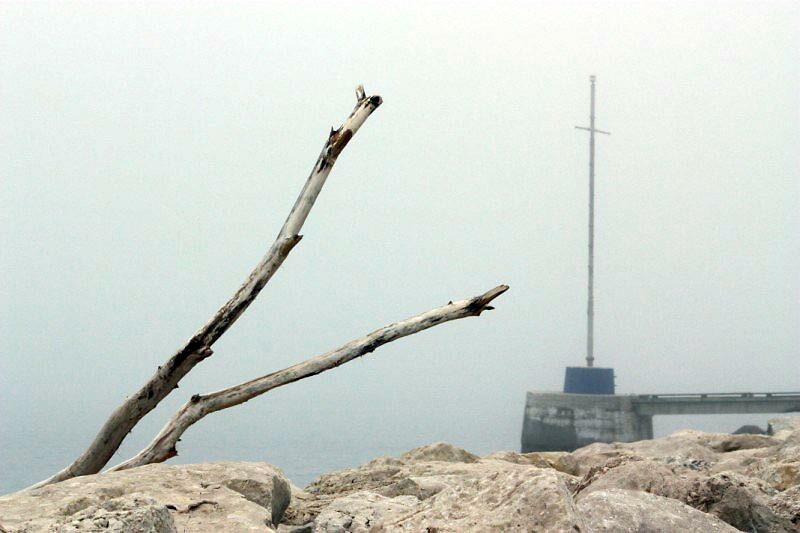 Typically, such lower humidity fog is preceded by a transparent mistiness along the coastline as condensation competes with evaporation, a phenomenon that is typically noticeable by beachgoers in the afternoon. Another recently-discovered source of condensation nuclei for coastal fog is kelp. Researchers have found that under stress (intense sunlight, strong evaporation, etc. ), kelp release particles of iodine which in turn become nuclei for condensation of water vapor. The thickness of fog is largely determined by the altitude of the inversion boundary, which in coastal or oceanic locales is also the top of the marine layer, above which the airmass is warmer and drier. The inversion boundary varies its altitude primarily in response to the weight of the air above it which is measured in terms of atmospheric pressure. The marine layer and any fogbank it may contain will be “squashed” when the pressure is high, and conversely, may expand upwards when the pressure above it is lowering.